Guest post by Dan Saltzstein, a cocktail enthusiast and an editor in the Travel section of The New York Times. Do yourself a favor and follow him on Twitter. The origin story of my house cocktail begins with a glass of amaro, the bitter Italian liquor flavored with a secret mixture of herbs, roots, dried citrus peel and who-knows-what. After a meal at Frankies Sputino, a terrific Italian restaurant in Brooklyn, a friend offered me a taste as they drink it in Italy: straight-up, after a meal, as a digestif. I wasn’t a fan. Too syrupy, too bitter, too sweet. But, I thought at the time, this would go great with some seltzer and a splash of citrus. So I tried that combo -- and loved it. The seltzer cut through the viscous amaro and some lemon (or a combination of lemon and orange) brightened its dark flavors. It was refreshing, tasty and (to use a word I try to avoid when writing about booze) addictive. I tried a few amari and settled on Averna, a Sicilian brand that is particularly herbal and dark. I drank that combo all through that summer. Then I came into some prosecco, the sparkling Italian wine. I substituted it for the seltzer and loved the new combination. That became my house cocktail, which I dubbed the “12V,” after our apartment number. But who wants to open a bottle of prosecco every time you want a cocktail? My experimentation continued. Rye has always been my favorite base liquor for cocktails. I love its mellow sweetness (less than bourbon) and spicy aftertaste. (Michter’s is great, as is the new Bulleit rye, but Old Overholt, with its $20 price point, is my go-to for cocktails.) [Ed. Note: Dan, is that for a liter? If ever in NJ, a liter of Overholt costs like $12 at Wine Library. Plus: unlimited cheese sampling!] So I tried rye, amaro and lemon -- ok, but too harsh. At the time, I was also playing around with homemade syrups, and had stumbled on ginger syrup, which I loved. I tried it with the rye, amaro and lemon. Perfection. 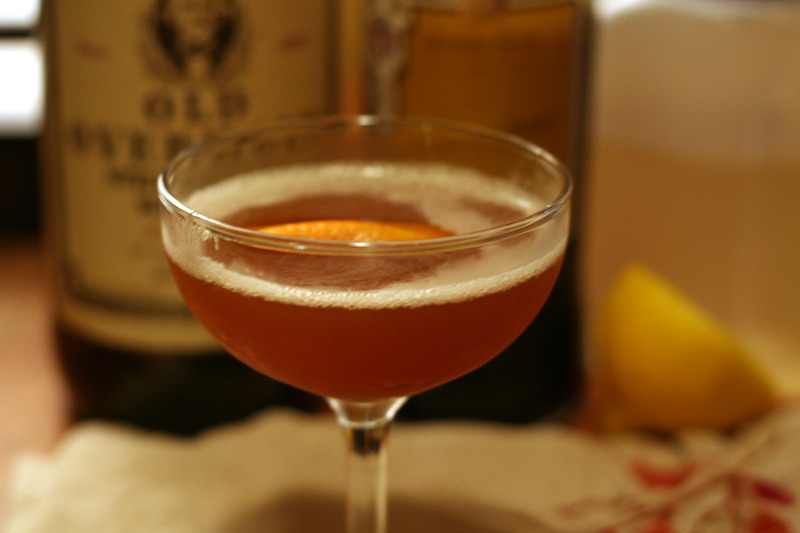 The sweetness of the syrup mellowed the whole thing and the infused ginger added a kick that echoed the rye’s spiciness. A few weeks later, I was invited to a party thrown by my friend Kat, who has perhaps the most elaborate home bar set-up I’ve ever seen. [Ed. Note: Let the record show, Dan's not been to my house yet.] Maybe I was feeling a little competitive. I brought with me a bottle of Averna and some of my homemade ginger syrup. Kat was plenty busy with the grill and asked me to make a few rounds of my new house cocktail. I was happy to oblige. Our mutual friend Michael noted that the cocktail needed a new name. I asked him to come up with one. Without much thought, he said, “The Witty Comeback.” I loved it, even though I had no idea what it meant. Shake all ingredients vigorously over ice and serve in a chilled coupe glass. Garnish, if you want to be fancy, with a flamed orange peel.